Know What I Mean? : How Can You Not Love This Game? 1867. Only one school in the nation has been playing football since then. And for most of my life, they've been the worst football program in division 1-A. Hell, for that matter, they've been one of the worst programs of the 20th, and 21st centuries. Not anymore. 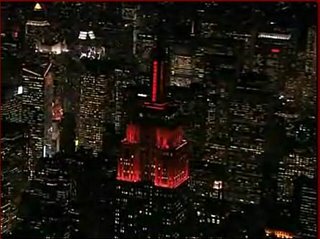 Rutgers University, in New Jersey, burst back onto the national scene tonight by beating the third ranked Louisville Cardinals. The Cardinals had the national stage via a trouncing of then number three West Virginia - and the Cards also had a good chance at a national championship bid by virtue of winning out. And this game didn't disappoint. Louisville is an offensive juggernaut this season - as they are most seasons. Rutgers, is well Rutgers. They play in the Big East, which the last few years has not been very highly regarded by the so-called powerhouse conferences. But there's something magical about college football. It doesn't matter who's playing - or what the rank is. You get 100 college kids inspired, and they can do anything. And it's damn fun to watch. Rutgers went down one point 25-7. But what kind of story would that make? An air tight defense in the second half bogged down Louisville. If it weren't for my boy Brady Quinn, Louisville's quarterback, Brian Brohm, would be the most highly regarded QB in the country. Think Rutgers cared? Nope. This is college football. Rutgers prolly hasn't been on national television, since..... well maybe they were once by accident when they played Notre Dame a few years back. See, when you're that bad for that long, you really don't get that much respect. So for everyone that didn't have money on the game, or that isn't a UL or RU alumni - shame on you. This is college football. Games like this HAVE to happen. The football Gods wouldn't have it any other way. A masterful second half defense held Louisville scoreless for the whole second half, and Rutgers worked their way back to a tie game. Louisville got the ball back with a few minutes to go, and Rutgers defense held yet again, forcing a punt. Rutgers moved down the field on nice, precise short passes, and a few great runs to set themselves up for the winning field goal as time expired. The kicker lined it up, and missed it. That's right, he missed it. Now this is college football - and there have been plenty of stories that end with a missed field goal. It's the football gods way of mocking kickers for not being real football players ( sorry Brad ). But every once and a while, the gods smile on the kickers, and give them another chance ( i.e. PSU FSU Sugar Bowl last year ). An offsides penalty on Louisville ( I wouldn't want to be that kid in film session tomorrow ) gave the Rutgers kicker, Ito, another chance. And this one he nailed. 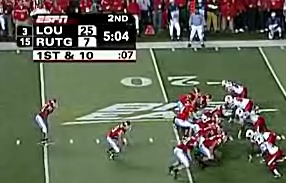 And as if on cue, and it were planned, ESPN showed the kick from the 'skycam'. After making his kick, Ito turned around and pointed to the camera before being mobbed by teammates, and eventually the whole state of New Jersey. This is college football, and that's the ending I should have seen coming. I have this thing about my list of things to do before I die. Everyone's got one, and my list is a simple one. Visit the major college football stadiums. The Big House, The Swamp, Rocky Top, Oklahoma, Ohio State... the list goes on. So far, I've crossed off Camp Randall, Notre Dame Stadium, and Happy Valley at Penn State. Rutgers was on my list, but really for the only reason that it was the birthplace of college football. Lets just say it wasn't on the top of the list when it came to the order of stadiums I'm going to visit. But after tonight, it moved up the list some. I love this sport. posted by Kuflax @ 12:59 AM 1 Whatcha' Gots To Say? Even *I* watched that game when it became an instant classic on ESPN Classic. You know it's a good game when I watch a college football game by myself, and it's not a Badgers game.